It’s nice to know that you don’t have to venture off too far for good food. 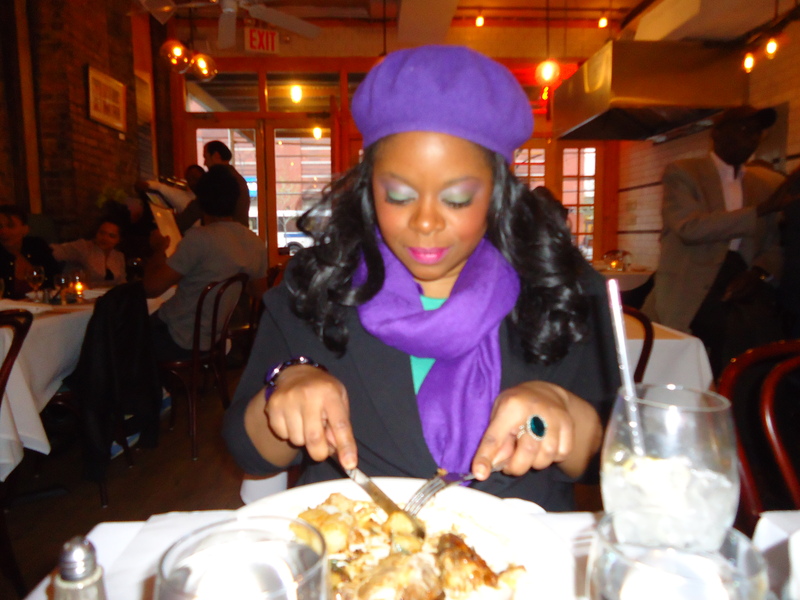 In New York City’s Mecca of soul food restaurants I found a beautiful French bistro set in the heart of Harlem. Next door neighbor to acclaimed Chef Marcus Samuelsson’s highly praised restaurant Red Rooster is a quaint French restaurant named Chez Lucienne. The restaurant has a side walk café area. The inside of the restaurant is cozy and their wet bar is smaller than most; however, Chez Lucienne makes up for size with food that is big on taste. Along side classic French dishes like escargot and foie gras, you can enjoy a simple hamburger made with top grade beef. I enjoyed their Poulet Roti a l’Ail, which is 1/2 crispy roasted free range chicken with garlic confit and rosemary roasted potatoes. The dish is heartwarming as it makes you feel like you are enjoying a plate of food cooked by your mother. Although my mom is no cook, and definitely has not and will not make any attempts to create any form of French Cusine in the kitchen, Chez Lucienne’s Poulet Roti a l’ Ail made me feel nostalgia of a non-existent past where I enjoyed great food made by my mother. The chicken is cooked perfectly, and the onion confit makes you want to lick the plate. The roasted potatoes have a definitive taste of fragrant rosemary with subtle flavors of other herbs and spices. The potatoes are crisp on the outside, yet melts in your mouth after each bite. The combination of texture is like a classical ballet in your mouth – beautiful and captivating. A ramekin of crème brulee was placed before me as dessert. The crunch of the caramelized sugar, some portions more burnt than others; lends itself well to the creaminess of the French custard. Once again the combination of consistencies – crispy and creamy – is what proves that great food is more than just taste. If you are ever in the Harlem area searching for a quality dining experience, may I suggest you step outside of the typical fried chicken and baked macaroni many of us have grown accustomed to? Submerge yourself in the diversity of the new Harlem, New York City. Chez Lucienne offers foreign food with an atmosphere that is every bit of home.